A CTV story about how the government may use Meta Data collected from OSINT (Open Source Intelligence) and how this may or may not effect privacy issues. 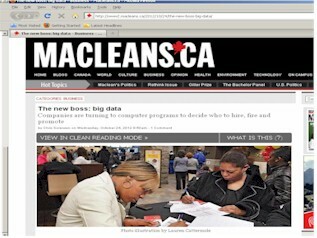 Richardson was interviewed by CTV for this story which first aired in June 2013.
www2.macleans.ca/2012/10/24/the-new-boss-big-data/ The screen capture to the left refers to an article in Maclean's magazine Oct 2012 discussing the role of software programs in decisions about employee performance, hiring, firing and promoting. "Hiring and training new employees is expensive, and most corporations try to keep staff turnover, or “churn,” to a minimum." 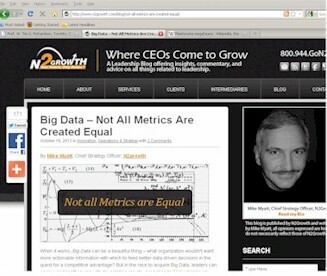 "It’s all part of a larger shift toward the use of data analytics, or “big data,” in the corporate world. While crunching massive databases in search of insights into consumer behaviour is fast becoming standard operating procedure (Amazon’s product recommendation engine is a good example), the notion of using the same tools to manage a company’s own employees is more controversial, mainly because it’s not an exact science"
"The potential market for such products is huge. A recent IBM survey of 1,700 chief executives found that 71 per cent said human capital was the most important factor in maintaining a competitive advantage." "in the race to acquire Big Data, leaders can easily wander off course with devastating results"